So we only touched upon the cool things to do on First Fridays in the Finger Lakes. At the Seward House Museum, you will enjoy a free tour taking you back in time when William Seward lived in Auburn with his wife Fanny and their children. The Seward House is so beautiful and on First Fridays you’ll be treated like royalty when you travel back in time. 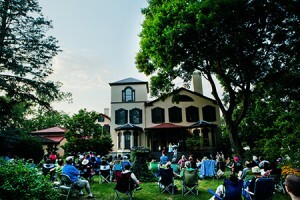 Don&apos;t miss them in the summer time either when the have "Shakespeare in the Garden" on a First Friday. Be sure to bring a lawn chair, or blanket and spend a relaxing evening. Need a one of a kind gift for a friend, check out the collectibles at Beautiful Things and Affordable Treasures. Owners Bill and Deb Havdoglous spent their lives living in Long Island and New York, but fell in love with the Finger Lakes. These retirees came as visitors, but loved the quaint town of Auburn so much that they moved here in 2005! Their shop is full of quality antiques and treasures - all reasonably priced! Hungry? Thirsty? On First Fridays, two for one drinks at Auburn Ale House plus two for one appetizers, half-price burgers at Swaby’s, and “The Ultimate Irish Burgers” at McMurphy’s Irish Pub which is located in the Holiday Inn. Happy Birthday to the Finger Lakes Artist Cooperative at 101 Genesee Street! On First Fridays, enjoy refreshments, music, and ART at this new and thriving cooperative where locals display their amazing talents. When you visit Auburn, NY cradled in the Finger Lakes, you can experience art, music, a lively downtown, delicious foods, unusual cocktails, history, and more. First Fridays of the month are an excellent time to visit our small city with big venues.